I toyed with giving Warlock of the Witch World (henceforth, WotWW) two stars because, compared to its predecessors, I didn’t enjoy reading it as much but the last third of the book and a conceit that I realized while writing this review redeemed it somewhat. [b:Three Against the Witch World|2519588|Three Against the Witch World (Witch World Series 1 Estcarp Cycle, #3)|Andre Norton|http://d.gr-assets.com/books/1281655867s/2519588.jpg|1979484], the immediately previous novel, primarily followed Kyllan Tregarth, one of the triplets born to Simon and Jaelithe, as he broke the mental barrier that hid the East from the mind’s of Estcarp’s people and discovered the Old Race’s homeland of Escore. The triplets’ presence, however, awakened ancient Powers both Good and Evil and reignited the struggle that drove the original Witches from the land long ago. In WotWW, the story focuses on the second son of the trio – Kemoc, the titular “warlock.” The Valley of Green Silences, chief citadel of the Light, is besieged and its people are looking for allies. One of these potential friends is Dinzil of the Heights but Kemoc senses something foul underlying the man’s handsome and ostensibly friendly exterior. Unfortunately, no one else feels similarly and Kemoc has no supporting evidence. Dinzil seduces Kemoc’s sister, Kaththea, and lures her to his seat of power in the mountains. The book is the story of Kemoc’s efforts to rescue his sister and expose Dinzil’s malevolence. I don’t believe I’m spoiling anything to say that he’s ultimately successful but the price is dear, and Norton again dwells upon a favorite theme in her writing – the personal cost of Power even when wielded for Good. It’s not a bad tale. My chief problem is that I’m not very interested in Kemoc as a character. Two things annoyed me especially. One was that Kemoc spent a lot of time being rescued or relying upon the skill and power of others to get out of scrapes. Perhaps this is an inversion of the usual “girl needs rescuing by the hero” trope; a particularly insidious inversion as his guardian angel is Orsya, a Krogan girl who defies her people to aid him. If this is the case, it puts the book in a whole new perspective. I’ve written elsewhere that Norton is a far subtler writer than usually given credit for, and this could be further proof of that. 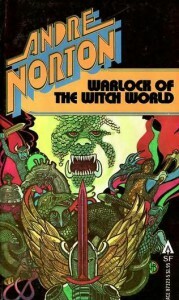 A final observation: While considering what to write here, I was struck by the parallels I saw between Norton’s “Witch World” series and [a:Robert Jordan|6252|Robert Jordan|http://d.gr-assets.com/authors/1175475715p2/6252.jpg]’s “Wheel of Time.” In both a near-utopian society is destroyed when some people – in their arrogance and lust for power – began experimenting with Powers little understood or ultimately controllable. After the ensuing apocalypse, the human survivors create a civilization ruled by female Witches who fear and distrust any male who exhibits a hint of Power. I don’t want or need to push the parallels much further but I wonder what, if any, influence Norton may have had on Jordan. Even if not the best in the series, if you’ve fallen under the Witches’ spell then you should read Warlock of the Witch World.